(Nanowerk News) Reporting their findings in Advanced Materials ("Plasmonic-Assisted Graphene Oxide Artificial Muscles"), researchers in China have developed a plasmonic-assisted holistic artificial muscle that can independently act as a fully functional motor system without assembling or joints. The artificial muscle's low-cost integrated design consists of a composite layer uniform bilayer configuration made of gold nanorods embedded in graphene oxide or reduced graphene oxide and a thermally expansive polymer layer (PMMA). The gold nanorods of varying aspect ratios endow the graphene nanocomposites with tunable wavelength response. This enables the fabrication of a light-sensitive artificial muscle that can perform complex limb-like motions without joints. Combining the synergistic effect of the gold nanorods' high plasmonic property and wavelength selectivity with graphene's good flexibility and thermal conductivity, the artificial muscle can implement full-function motility without further integration, which is reconfigurable through wavelength-sensitive light activation. Upon photothermal heating, the mismatch between the deformations of two layers leads to significant bending, replicating the muscle-like contraction from one layer and expansion from the other. 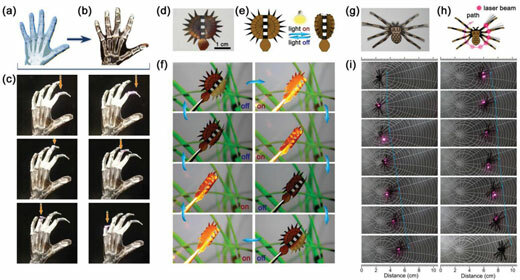 To demonstrate the light-addressable manipulation of complicated multiped robot, the team developed a holistic spider robot. They patterned each leg of the spider with three nodes (see figure g above). Despite that the spider has been patterned on 2D film, it can deform into 3D structures under light irradiation due to the bending of its legs. When the laser beam irradiates the legs one by one, the legs bend one after another, which induced the displacement of the gravity center of the spider accordingly. In this way, the researchers could control the spider robot to lean forward and move toward the right direction at an average speed of 2.5 mm per second. 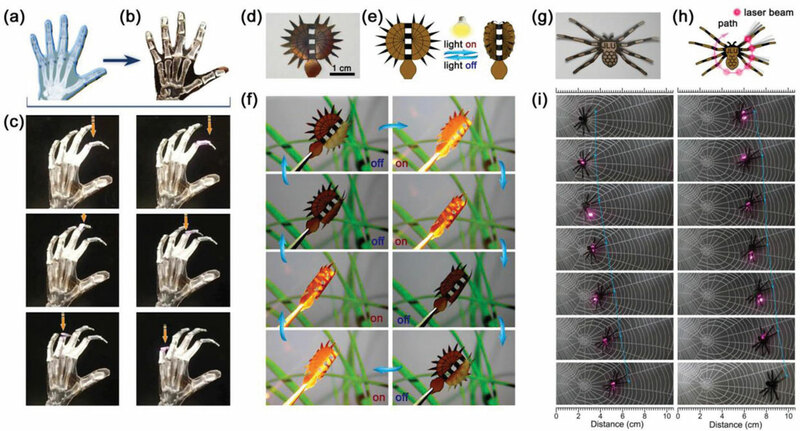 The authors conclude that their work bridges the gap between ideal request and realistic restrictions of biomimetic motor systems, and decreases the amount of discrete parts, the number of postprocessing steps, and the fabrication time, and thereby offers new opportunities for biological aid and for biomimetic mini robots to be remotely operated.